Hi everyone. It's a long time since my last post. I've been working outside my hobby but managed to fulfil some of my new ideas. I'll show you them later. Still I'm making my little flowers. Pansies are still my favourites and lately they were very popular on etsy and I got a lot of orders from the UK and USA. Actually I counted the quantity of them that I've sold and was quite surprised to find out that it was more than 1200. A couple of years ago when I got back to my hobby and picked up my hook and fine thread I was just enjoing experimenting with them, trying different combinations of colours and shades and textures and was delighted to find out that people actually liked what I made. But I never knew how they were using my flowers. But due to their feedbacks and orders I found out how creative people were. So here are some ideas for the projects where you can use crochet flowers. First of all crochet flowers are embellishments and are widely used to brighten your clothes especially for little ones. This field of crochet flowers was made to order to embellish a poncho for a toddler girl. They can be widely used at home decor - to embellish lamp shades and duvet covers. If you wear hair accessories these pretty handmade slides will make you look different. They are also very popular among scrapbookers as the flowers are of the size which is suitable for small projects and will add special touch to your cards. I hope my ideas inspire you in your own projects, if you crochet flowers but not sure how to use them. If you are interested in purchasing my tiny pansies they are available in my shop on etsy. Or you can buy them here. 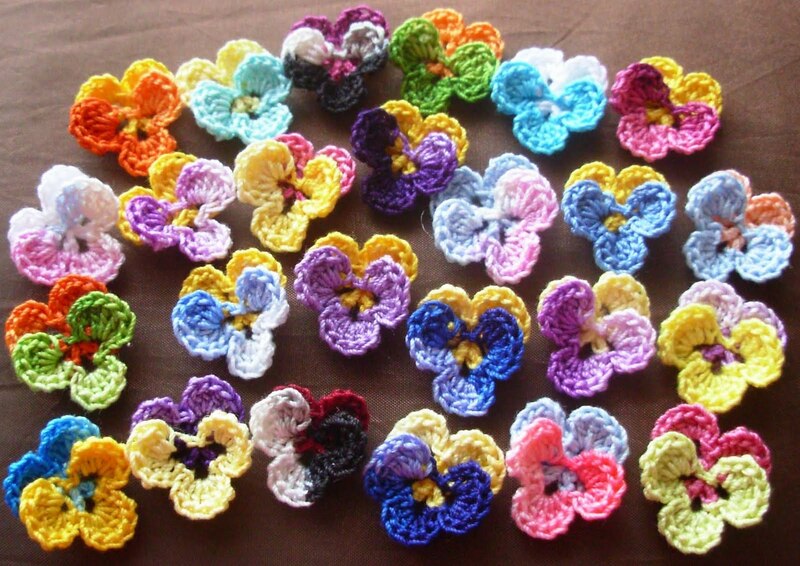 A set of 25 hand crochet from cotton mercerised thread pansies in bright colours. Size: 0.8" long and 0.8" across. These pansies will look great as clothes accessories, especially jeans, or bag/cushions embellishments. They are ready to fulfil any of your creative ideas. You can use them as a single item or group them together. Thanks for reading it. Will try to update regularly. Hi there. My name is Irene and I love all things handmade! These little flowers are adorable. I like to crochet them and use in my crafts.